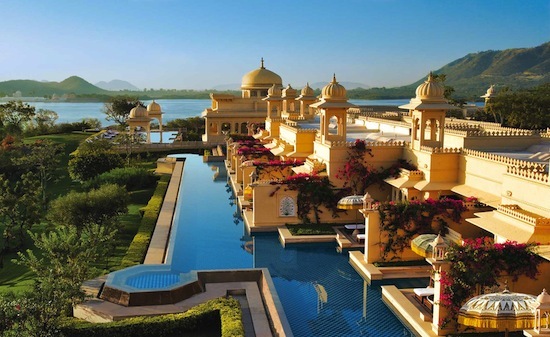 This is one of the best places to spend your honeymoon in India simply because it has a regal feel. Not only is this city filled with luxurious places that makes you feel like a real princess, it is also the city where many star celebrities and the who’s who of the country have got married. It is a romantic place to start off with your newly blessed life. The classy blend of architecture and charisma here provide you with a truly blessed feeling. Of course, there are tons of places to continue the honeymoon journey too but starting off here is ideal because of the gorgeous lake here. And if you are one of those people who love to have a Bollywood connection with your honeymoon then too stay at the Taj Lake Palace. Sure it is a little steep but then you can actually enjoy the romance here like in the bollywood flick ‘Ye jawani hai diwaani’ was shot here. Being on the lake is awesome fun because you are simply secluded in this little quaint area that you can call your own. And on your honeymoon, that is all really that you care about. Plenty of sightseeing and shopping is on the offer too! Another destination that is high on your honeymoon list should be Jaipur. Like Udaipur, Jaipur, the capital of Rajasthan is definitely the city of the prince and princesses. Another classic way to start off your love saga. It has historical locales, grand palaces and exotic destinations to check out. Also known as The Pink City, you have plenty of options here to be a part of a particularly regal honeymoon. Some of the best places to stay here include Rambagh palace, Raj Palace, Oberoi Rajvillas, ITC Rajputana and Fairmont. It is a popular wedding destination too. But since you are starting your newly wed journey here, Jaipur also very famous for some of its religious shrines and temples. So you can seek the blessings from the lords and start off with your perfect honeymoon dream. For those, who love to indulge a bit, in spite of just getting done with your wedding or trousseau shopping, there is plenty of options out here. Be it jewellery, exotic handicrafts or even just colourful attire, there is a lot on offer here. Apart from the shopping, it is also the central district for doing some great sightseeing. Head to the Amer Fort or go down to one of the tourist sites like the Jantar Mantar. If you had a winter wedding, then a honeymoon here would be just perfect. Mount Abu is also the only hill station in the city of Rajasthan. Unlike the other dry and more arid areas, this region has been blessed with divinity and lush greenery. It is also known as the forest of Arbudhya and is like an oasis in the dessert. Located at a height of about 1100 meters above sea level, it is an ideal honeymoon destination in Rajasthan. You can hang out here near the Nakki lake, go trekking or simply laze around enjoying nature and serenity. In particular the sunset here is known across the world. You can simply click away pictures or spent some quite time as you enjoy the sunset here. The region is also famous for its many temples here and legend has that visiting the local goddesses here helps one start off a blissful life. If you are getting married in the summer months and want to enjoy a honeymoon in Rajasthan, then this is the ideal place. It is not too hot during summer months and is still gives you that regal feel of being in this princely state. The city of Jodhpur is also known as the blue city of India. It may be blue, but the feeling of being here is definitely not that colour. In fact, it is also one of the best places to honeymoon in. It is truly a regal place because it is the home to some of the oldest palaces in the country. You can also find quaint resorts located on hill tops too. One of the most palatial places to stay here during your honeymoon would be Umaid Bhawan, which was the home of the royal family, who still live in a part of the hotel. Apart from the royal castles and the palatial structures, there is a lot more to see in Jodhpur for the newly married couple. Hold hands as you squabble mockingly over the prices of goods here or take your partner for some luxurious shopping. There are plenty of other popular tourist destinations here too where you can do some sightseeing before returning to a luxurious couple’s massage back at the hotel. If you are one of the people who don’t want to miss out on anything, be it sightseeing or exotic delicacies of Rajasthan, but yet want to get that regal service. Hop on to the Palace on Wheels. It truly does justice to its name. There is no denying that the Rajputs, led a grand and majestic lifestyle and you want to make sure that you live some of it during your honeymoon. It is there perfect way to begin your journey through this princely state. There are special services available for the newly weds on this train.To start off with, you get a luxurious cabin that is thoughtfully decorated and managed to keep your honeymoon trip in mind. 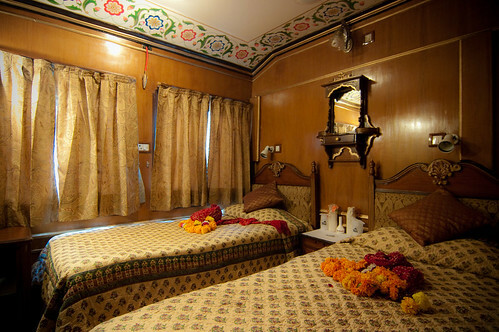 There are attached toilets in the cabin along with romantic music, intercom for any requirements that you may have and of course, beautiful and elegant ethnic Rajsthani décor. There will be a personal attendant/Khidmatgar, at your beck to make sure that your awesome trip just gets better. The idea is to provide you with a complete experience where you don’t miss out on anything. You can indulge in the luxurious dinner that is served complementary food on board. There are a variety of cuisines ranging from Continental, Chinese, Indian and Rajasthani cuisines here to keep you happy. And for your spirits soaring or just a special candle lit dinner, fine Indian wine is available at your service. It is a complete experience for the honeymooners because they get to enjoy the luxury of seeing most of the Rajput royal states along with staying at heritage hotels like the Rambagh Palace hotel in Jaipur and the lake Palace hotel of Udaipur. The meticulous planning and execution is done completely by the train staff. All that you have to do is just book your dates and start off on your royal honeymoon travel! The sand dunes of the Thar desert of Rajasthan are not only mysterious and gorgeous, but the beautiful tent hotels here provide you with an experience that none other. It kind of takes you to the mysterious Arabian Night tales where you experience the camel rides and actually feel that you have gone back in time. Special honeymoon packages and tents are available here along with night safaris and moonlit dinners. Imagine being alone in the desert in the middle of the night as you say cheers with chilled wine and enjoy a cool desert night. What’s more, there is plenty of entertainment here like folk dances and games, etc. Of course, all of this comes without compromising on your privacy.